Concrete has been profusely used throughout History in order to satisfy the real needs of humankind: housing, shelter, industry and infrastructure. Since its early applications, concrete has been undergoing a continuous evolution due, firstly, to the inventiveness of builders and, more recently, to persistent researchers. In fact, within the last two decades, progress in concrete technology has allowed numerous and innovative improvements for a classical material whose cost-effectiveness and versatility remain unrivalled. Nevertheless, new challenges continuously arise, thus requiring new answers. Concrete is the second most-used material in the world (second only to water) – up to more than one cubic meter for every person on Earth, according to some statistics published shortly before the global crisis of 2008. The quantity of concrete produced is so large that, although it is, in fact, a relatively low-carbon product compared to other construction materials, it nevertheless accounts for about 5% of CO2 emissions of the world. Not surprisingly, therefore, there are colossal research efforts being made across the globe by cement and concrete producers to reduce the carbon impact, with considerable success. It is clear that we will not significantly reduce the amount of concrete used on Earth in the near future. However, we can carefully examine the way we use it. The current efforts towards sustainability take existing structures into account. Indeed, many concrete structures or facilities are nearing the end of their service life. Therefore, in order to keep their performance above acceptable threshold values, they must be assessed, refurbished or, in some cases, demolished. In this last case, many of the old materials – including concrete – may be recycled, as recent experiences have proved. The management of the life cycle of existing structures– erected when sustainability concepts were not yet considered – provides new opportunities in different fields of activities. These include conceptual attitudes and the basis of decision (maintenance engineering), new materials and techniques for repair and strengthening, as well as more interaction with other matters of concern, such as energy efficiency, reuse of materials or, among others, issues related to our cultural and historical heritage, considered from an updated perspective. In this regard, a fundamental part of the mission of the fib is to synthesise the latest research in design and construction to facilitate innovation and the smart use of concrete. Our federation has produced outstanding contributions in the last years and is currently devoted to a new edition of the Model Code, expected to be completed in 2020. This huge task, based on the sound tradition of the past fib’s Model Codes, provides to worldwide users a consolidated synthesis of recent knowledge. The Model Code 2020 addresses both the design of new structures and the assessment and refurbishment of existing constructions, whose service life can be extended – perhaps for different purposes. There is no doubt that the enormous challenge of preparing such a document will contribute to the increased and improved use of concrete in the near future, inspiring updated supra-national and regional codes. Considered from the above-described perspective, our Awards seek to recognise the outstanding, whether the concrete is visible or not, whether it is a new or an existing structure, making true once again the Vitruvian virtues: Firmitas (bearing capacity and durability), Utilitas (functionality) and Venustas (beauty, aesthetical adequacy) in mutual equilibrium. I encourage you to leaf through this book, which contains some of the outstanding achievements of the worldwide Structural Concrete community during the past four years. 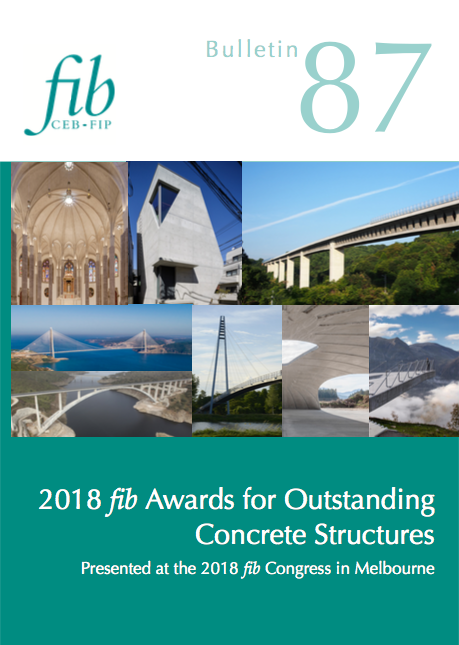 I hope you will enjoy reading about the best new Concrete Structures as we present the Outstanding Concrete Structures Awards at the 5th fib’s Congress in Melbourne in October 2018.